ALUMNI HALL -- During an annual blood drive last month, students were urged to participate and donate all of the plasma they could “muster up” to the United Blood Services, who had set up shop in the lobby of Alumni Hall. 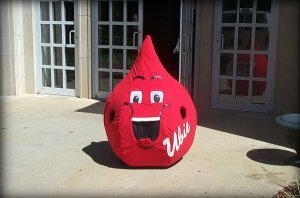 In order to raise life-force giving morale, the UBS mascot “Ubie” was set loose to roam about campus freely. However, no one could have imagined what was being contemplated behind that blank, expressionless stare. No one could have predicted what occurred next. 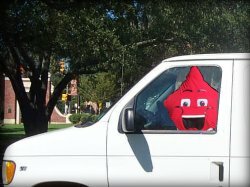 According to eyewitnesses, Ubie suddenly leaped up out of his dormant state and lunged for the door on the driver’s side of the United Blood Services van, parked nearby. Then, upon taking control of the steering wheel, Ubie glared out at curious on- lookers with a maniacal grin and drove away. The UBS van was last seen taking a left on Monroe.